Loved our stay here, didn't want to leave. Room tip: Ask about a lower floor room if you are'nt good on stairs. The Rooms are big and nice and have a good infrastructure. The Whirlpool on the balcony was nice and added a lot to the atmosphere. Room has a full kitchen and a nice and clean bath. Only thing is: it's very quiet and idyllic on a little island. That means, that you need your car to get to the towncenter, because it would take quite a long way back all around the harbour to get to the city by foot. Else it was a perfect stay. Room tip: Room with whirlpool on balcony is great. We stayed here for three nights and the suite felt really comfortable. With the view on the inlet, we were lucky to see a black bear on the opposite shore. You can park right outside your suite as well. the only thing that needed replacing was the frying pan. Ucluelet itself offers everything you need. 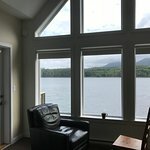 We stayed for two nights in an inlet view suite after being upgraded through Booking.com due to a double booking. The property was beautiful, clean and well maintained. The place was very busy but we didn’t hear noise from other guests. We had a Jacuzzi tub on the deck which was very nice. 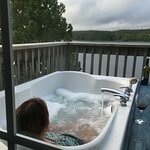 Even when it rained we could enjoy the tub and the view. Beautiful Location but NO SCREENS!!! No Screens on Any of the WINDOWS where the MOSQUITOes are HUGE & NUMEROUS! Great Trails & Restaurants in nearby Ucluelet. Tofino is a great town 45 minutes north and well worth a day trip or two. Hello briancV6838HZ and thanks for sharing! Great to see you enjoyed the beautiful location of Waters Edge. We are so lucky to have this small island for our peaceful resort! We are surrounded by marine life in the Ucluelet Harbour and every suite has a view of the water. Did you use your kitchen in the suite? Best views in town for sharing a meal with someone special! The CO-OP is like a general store and has everything you need to stock the fridge and cupboards. We don't usually have very many bugs here, maybe a few for a half hour at dusk? Hope they didn't bother you too much! And it's a good idea to have the spray on the trails in the forest! Thanks again for sharing your review and staying with us while you were on the coast. Cheers from Ucluelet and we hope you join us again! Kim Foster, Guest Relations Manager.